My pride and joy. Maybe an obsession. Who knows. Who cares. IT'S SUMMER! It's hot out and it finally happened y'all. July is National Ice Cream Month aka my favorite dessert. In honor of the made up holiday, it only felt right to round up my favorite ice cream spots around town. I can't start this post without listing Molly Moon's first. This was the very first ice cream place I ate at in Seattle after finishing freshman orientation at UW. From this initial encounter with the Seattle ice cream giant, I was hooked. There would be many ice cream runs to follow - serving as the reward for decent grades, convenient place to meet and catch up with friends, perfect spot to walk to after a terrible day, or oasis to cool off on the long summer evenings. It holds a special place in my heart. Not only does Molly Moon's make an impact on me, but on the community at large. The company is a big proponent for giving back and engaging with the community such as incentivizing customers to vote by giving free scoops of ice cream to those who bring in their ballot stubs. They've also started the Anna Banana Milk Fund in honor of Molly's late sister which provides milk for families in need. The mantra ice cream makes you happy is a testament to the service and quality they scoop. Their specials are nothing to sneer about, but the permanent menu always brings it's A-game and keeps me coming back: Cookie Dough, Salted Caramel (on the saltier side but amazing), Honey Lavender, Scout Mint (in conjunction with girl scouts and sending them to camp) and Earl Grey. The OG ice cream joint in my mind. Molly Moon's just celebrated their ten year anniversary this year and it just so happens that they opened their doors on my birthday! It's like they knew! The Newcomer that is taking over the ice cream scene. The cacti, pastel colors, and mid-century decor are reminiscent of sunny Palm Springs. Stepping into the shop feels like you've been transported to California, which is especially helpful on those gray January days. Plus, you should go solely for the swanky wallpaper outfitted in both stores, it's too cute! The kicker here is that this is plant based ice cream. Crazy right?! Dairy free/vegan folks rejoice! I'll admit, I was skeptical about most of the flavors the first time I went, intimidated by the foreign combinations. Like, I don't want peas and beet in my ice cream!! Now my favorite was a recent seasonal flavor: Almond Butter Kale Caramel. Yes, kale. So this one is guilt free, right? Focused on sustainability and local partnerships, the F&J team is transparent about where they are sourcing their ingredients. Whether it is vanilla from a woman lead farm in Mexico or local coffee roasters down in Tacoma, the founders know who they're working with. Be sure to taste a little bit of everything when you go, but you've gotta try Salty Caramel Ash, Brown Sugar Vanilla, Tahini Chocolate, California Cabin, and Beet Strawberry Rose. I was devastated when they closed their doors in Capitol Hill a few years ago and rejuvenated when I moved over to Green Lake to discover how close I was to their Phinney Ridge location. My first brush with ice cream shop came one hot afternoon when I was strolling around with a friend in search of something sweet to snack on. We preceded to try nearly every flavor (which was extremely excessive on our part) and walked away with double scoop cones that put a smile on our face. The creamy, small batch ice cream store has been serving north Seattle and everyone's ice cream cravings. They constantly collaborator with local producers like Caffe Vitta, Theo's Chocolate, and Elysian to enhance their unique flavor menu. When you step into the shops, it feels like you step back in time into an old ice cream parlor with white marble countertops, gilded letters, and dark stools. Their vintage baseball logo rounds out the old school feel and takes you back to simpler times. Tucked away in Chophouse Row on 11th and Pike in Capitol Hill is this tiny little ice creamery. For them, dairy is the name of the game, serving cheese alongside their homemade ice cream. It's the best of both worlds. The core ingredients for this hidden gem come from Kurtwood Farms on Vashon Island where they make most of their dairy goodness. Everything is fresh, fresh, fresh and rotates with the season. We're talking staples like Jersey Cream, Flora's Cheese, Rhubarb, and Berry to special ones like Tomato (!!!) and Avocado. They serve quality you can taste since they have a hand in the whole process from start to finish. Grab a scoop and have the most idyllic afternoon sitting out on the patio under the outdoor lights amdist the hustle of Captiol Hill. 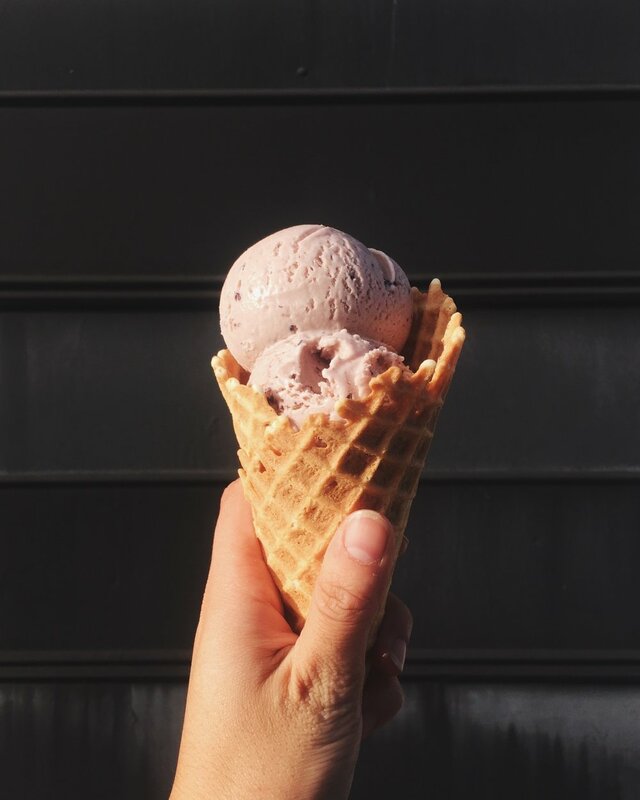 In the up and coming Central District resides Central District Ice Cream serving up the wildest flavors you've seen. Housed in a split level building, the walls are decked out in bright blue and lined with candy jars. Literally a sugar wonderland. Back to the flavors, they have a monthly rotating list which is always striving to push the envelope and step outside the box. There is constant innovation in flavor development from Elote to Ube Queso to Pistachio Fig Cheesecake - nothing is off limits. Further, this is an area of rebuilding and they're constantly giving back to the community by hosting regular pop ups, events, and artists showings. The 90's and grunge still live on in Full Tilt. The quirky ice cream hub is home to great ice cream, local art on the walls, and loads of pinball machines lining the walls. Again, another spot you just hit when you need some ice cream. There are traces of creativity everywhere you look from the ice cream flavors themselves to the staff doodles on the ice cream tags. They have the staples like Coffee and Cookie Dough, but more adventurous ones too like Ube and Thai Iced Tea (which is iconic). I debated on whether to include this ice cream shop on the list, but they were once my favorite ice cream place (replaced by McConnell's in Santa Barbara) and they're currently dominating the west coast, so I thought it was worth a mention. The Portland based ice cream shop is well worth the wait. Oh, and get ready because the line is often out the door, because people know. I died the first time I had the Sea Salt with Caramel Ribbons. It was a spiritual awakening and probably my favorite flavor of all time (aside from my beloved vanilla, which I paired with it for my double scoop). The thing I appreciate the most about Salt & Straw is the consistency. Whether I'm grabbing a cone on a rainy day in Seattle or waiting in line in the scorching Los Angeles heat, I know exactly what I'm going to get. There's usually extreme variations when a new location pops up, but not for these guys - they know what they're doing. The quality of the ice cream spans from Washington down to California. The classic flavors may be set in stone, but the seasonal flavors diverge from city to city and include a rotating monthly list of collaborations. When Salt & Straw first opened their doors here in Seattle, the focus was Seattle Chocolatiers. I love how they highlight local purveyors in the cities they call home: San Diego, Los Angeles, San Francisco, Portland, and Seattle.